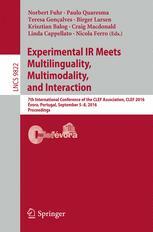 Individual working notes of tasks organizers and participants can be found within CLEF 2015 CEUR-WS proceedings. For people already registered to ImageCLEF (this year or in the past), you can transfer your registration details to CLEF 2014 here. If you have not registered in the past or you do not want to transfer your details, you can register for CLEF 2014 here. Building accurate knowledge of the identity, the geographic distribution and the evolution of living species is essential for a sustainable development of humanity as well as for biodiversity conservation. Unfortunately, such basic information is often only partially available for professional stakeholders, teachers, scientists and citizens, and often incomplete for ecosystems that possess the highest diversity. A noticeable cause and consequence of this sparse knowledge is that identifying living plants or animals is usually impossible for the general public, and often a difficult task for professionals, such as farmers, fish farmer or foresters and even also for the naturalists and specialists themselves. This taxonomic gap was actually identified as one of the main ecological challenges to be solved during the Rio’s United Nations Conference in 1992. In this context, using multimedia identification tools is considered as one of the most promising solution to help bridging the taxonomic gap and also being language independent. With the recent advances in digital devices/equipment, network bandwidth and information storage capacities, the production of multimedia data has indeed become an easy task. In parallel, the emergence of citizen sciences and social networking tools has fostered the creation of large and structured communities of nature observers (e.g. e-bird, xeno-canto, Tela Botanica, etc.) who started to produce outstanding collections of multimedia records. Unfortunately, the performance of the state-of-the-art multimedia analysis techniques on such data is still not well understood and are is far from reaching the real world’s requirements in terms of identification tools. Most existing studies or available tools typically identify a few hundreds of species with moderate accuracy whereas they should be scaled-up to take one or two orders of magnitude more, in terms of number of species (the total number of living species on earth is estimated to be around 10K for birds, 32K for fishes, 300K for plants and more than 1.5M for insects). The LifeCLEF lab proposes to evaluate these challenges in the continuity of the image-based plant identification task that was run within ImageCLEF lab during the last three years with an increasing number of participants. It will however radically enlarge the evaluated challenge towards multimodal data by (i) considering birds and fish in addition to plants (ii) considering audio and video contents in addition to images (iii) scaling-up the evaluation data to hundreds of thousands of life media records and thousands of living species. As described in more details above, each task will be based on large and real-world data and the measured challenges will be defined in collaboration with biologists and environmental stakeholders so as to reflect realistic usage scenarios. Taxonomic names are the primary key to organize life species and to access all available information about them either on the web, or in herbariums, in scientific literature, books or magazines, etc. Identifying the taxon observed in a given multimedia record and aligning its name with a taxonomic reference is therefore a key step before any other indexing or information retrieval tasks. The year following the launch of the lab could involve more complex information search challenges in the data (for instance species duplicate discovery or ambiguous species detection). The content-based approach to life species identification is intrinsically language independent and might solve many of the multi-lingual issues related to the use of classical text-based morphological keys that are strongly language dependent and that are understandable only by few experts in the world. Each task of the the lab is inherently cross-modal through the presence of contextual and social data associated to the multimedia content, including geo-tags or location names, time information, author names, collaborative ratings or comments, vernacular names, organ or picture type tags, individual specimen identifier, etc. Thanks to the multimodality of the three tasks of the lab, we hope bridging the barriers between the different information retrieval communities (text, image, music, etc.) and foster the emergence of a new trans-disciplinary community focused on life media retrieval.